Refrigeration unit added to the X-14 Benchtop Centrifuge. Temperature control from 2 - 40° C. Ambient temperature is 10 - 30° C. Refrigeration is CFC-free. Holds up to 10 user-defined programs. 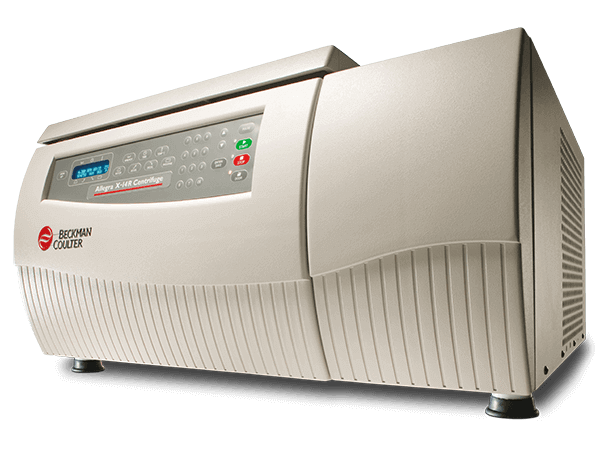 The Allegra X-14 benchtop centrifuge is a convenient, reliable workhorse piece of equipment that will speed up your process, cycle after cycle. The X-14 offers BioCertified* features for security from contamination, the ARIES Smart Balance Rotor System for faster setup and run times, and a versatile rotor for accommodating tubes, bottles and microplates. The X-14 has a maximum capacity of 3 L, offers extensive biocontainment options, and a 4 x 750 mL swinging bucket rotor (up to 4 300 x g/4300 rpm). Cell Culture Packages also include 15 mL (set of four) and 50 mL (set of four) conical adapters. Maximum capacity for these adapters is 56x15 mL and 28x50 mL. Blood Sample Preparation Application Packages also include 13 mm (set of four) and 16 mm (set of four) diameter tubes. Maximum capacity is 120x13 mm and 76x16 mm blood tubes per run. BioSafe Aerosolve Canister Packages also include a set of four Aerosolve canisters, four 15 mL conical tube rack, and four 50 mL conical tube racks. Maximum rack capacities are 24x15 mL and 16x50 mL. Microplate Application Packages hold up to sixteen standard microplates or four deep well plates. *BioCertified is a term used to describe products which have been tested and validated to demonstrate containment of microbiological aerosols by an independent third-party facility (Health Protection Agency, Porton Down, UK or USAMRIID, Ft. Detrick, MD, USA). Improper use or maintenance may affect seal integrity and containment.